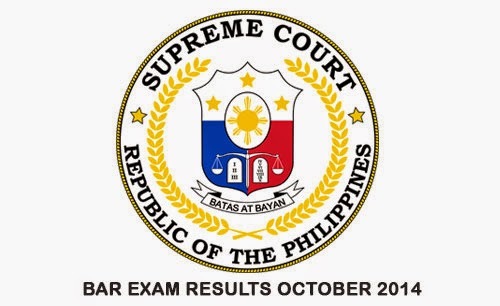 The Supreme Court of the Philippines announced the official bar exam results of October 2014, as it is the difficult professional examination in the Philippines, there are still many Filipinos trying to pass the said exam. The October 2014 Bar Exam of the Philippines was held at the University of Santo Tomas, which was held in four Sunday of the month of October. According to Supreme Court, there are confirmed 6,344 law students who took the hardest exam and hopefuls to be one of the list of passers that will be released on March 26, 2015. Justice Diosdado Peralta, the Supreme Court Associate said that there will be 80 percent essay questions and 20 percent multiple choice questions. But the initial list of confirmed 6,344 law applicants was trimmed down and a total of 350 takers have already opted to back out. The link above will become available today once the official bar exam results release by the Supreme Court, the October 2014 Bar Examinations which was held at the University of Sto. Tomas in Metro Manila will become available here soon. Comments or suggestions about "Bar Exam 2014 Alphabetical List of Passers" is important to us, you may share it by using the comment box below.